Homeowners are attracted to small homes for a variety of reasons. 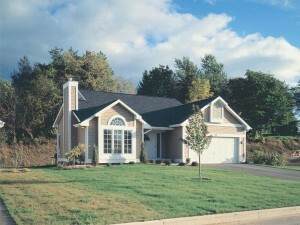 Some choose to build a small house plan because they are on a tight budget, others want to downsize from that five- bedroom, two-story home they bought when the kids were young, some live in urban areas where land is precious and lots are quite expensive, and others just prefer to live a simplistic lifestyle. Whatever the reason for building a small house plan, there are some features that will make it feel and live larger than its actual square footage. If you’re planning to build a small home, consider some of these elements to enhance its feel and livability. You’ll be making the most of your square footage while enjoying a spacious atmosphere. Choose a floor plan with an open layout. An open floor plan minimizes the use of walls in the main gathering spaces making each room or space look and feel larger. The lack of walls separating individual spaces helps everyone feel connected instead of creating a boxy floor plan where one room is cut off from the other. An open floor plan promotes flexibility. If you’re entertaining, your guests can relax on the sofa and chat with those eating at the table without having to move from one room to another. Look for tall ceilings. Consider a floor plan that offers volume ceilings in the living areas. Just like an open floor plan, tall ceilings eliminate the boxy feel sometimes found with small house plans. Instead they promote and open, airy atmosphere. From vaulted ceilings to two-story ceilings, the taller the ceiling, the more spacious your rooms will feel. Choose a floor plan with outdoor living space. When building a small house plan, outdoor living spaces can greatly enhance the spacious feel of the home by extending the main living areas outdoors. Floor plans with a screened porch, deck, patio or covered porch provide additional, usable space for gathering and relaxing. They are ideal for entertaining offering another place for guests to gather without making your small home feel crowded. Incorporate plenty of windows. Windows work wonders for small homes. Not only do they make your home feel not quite so confined by allowing a view of what is beyond the walls, but also, they allow natural light shine inside your home. Natural light promotes a bight and open feel while eliminating dark and shadowy corners. Just like volume ceilings, windows help eliminate the boxy feel sometimes found with small house plans. Try to include a few windows in every room of your home. A small home doesn’t have to feel crowded or confined. With a few of these tricks, you can make your small house plan live large! 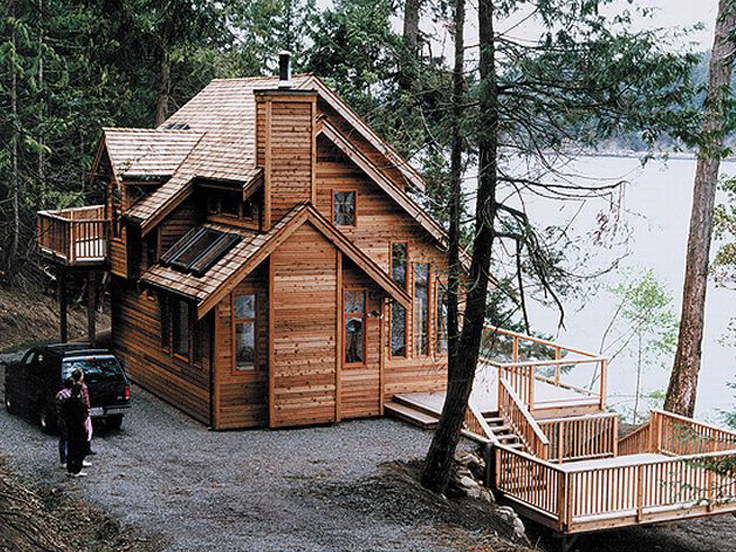 Take some time to browse our collection of Small House Plans. 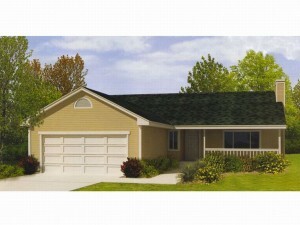 We have plenty that offer open layouts, volume ceilings, outdoor living spaces and/or abundant windows. Take a look at this eye-catching small house plan. It’s thoughtful and flexible design makes it suitable for young families with small children, retired couples or even singles. The exterior of this ranch house features traditional styling and enjoys a welcoming front porch. Inside, the living room is open and spacious accommodating daily activities and special get-togethers. The vaulted ceiling, plant shelf and crackling fireplace add a touch of elegance. You’ll appreciate the convenient pass-thru kitchen and its careful positioning next to the casual dining space making meal service a snap! Grill masters will love access to the rear deck making it easy to prepare favorite meats outdoors on the grill. Your master bedroom boasts a stylish vaulted ceiling, large closet and private bath. Depending on your phase of life you may opt for two secondary bedrooms for the kids or just one secondary bedroom and a cozy den. The choice is yours. A hall bath accommodates the needs of the children and guests. Practical and functional, this traditional empty nester home plan packs quite a punch for its small size. Furthermore, it is easy on the budget with its affordable design.